This is worth a close read–Rep. Marsha Blackburn continues to dig into the massive set of public filings issued by the Clinton Foundation and by some of its many affiliates. Regular readers will be familiar with the Gillard advances towards Hillary Clinton. It all started 4 years ago at the 2012 Clinton Global Initiative. 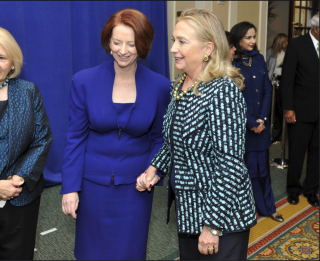 Gillard snubbed dinner with Obama to give Hillary more time to interlock fingers with her billion dollar baby. Scrolling down will find several posts of Smiths that show the full extent of corrupt practices from retired leaders. This entry was posted in media, Oz politics and tagged bill clinton, Charles Ortel, Clinton Foundation, government, hillary clinton, julia gillard, media, michael smith, politics, research. Bookmark the permalink. Do the Clintons answer questions?